The second day of athletics events at the Rio 2016 Olympic Games provided a range of superb competitions which included Mo Farah’s title defence in the 10,000m, a last-round win in the men’s long jump and discus, and new champions crowned in the women’s 100m and heptathlon. Nothing could stop Mo Farah from retaining his 10,000m Olympic title tonight. 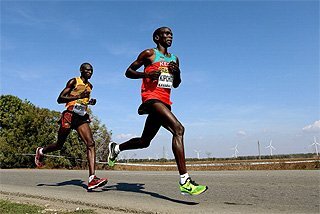 The Kenyans couldn’t, the Ethiopians couldn’t. Not even a fall on the 13th lap was going to prevent him from achieving half of his double title defence here in Rio. Farah’s race plan was clear: just stay in contact with whoever took turns leading the pack and kick at the bell. Things didn’t go so smoothly, though, as Farah suddenly found himself on the ground halfway through the race. It took the British world champion a few laps to get back at the front, but from then on he looked as determined as ever. 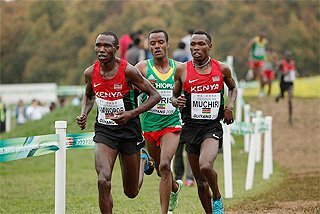 Paul Tanui made a brave move with 300 metres to go but Farah closed in 27:05.17, his second fastest time in a major championship. One half of the double done, Farah will return to defend his Olympic 5000m title on Wednesday. Jessica Ennis-Hill was also poised to retain her Olympic title here in Rio, where she would have to face world indoor champion Brianne Theisen-Eaton and European indoor champion Katarina Johnson-Thompson. But as it turned out, the biggest challenge came from 21-year-old Nafissatou Thiam who improved her personal best by a massive 302 points to set a national record of 6810 and become the first Belgian woman to win an Olympic title since Tia Hellebaut in 2008. En route to her Olympic gold medal, Thiam set a heptathlon high jump world best 1.98m and a personal best 6.58m in the long jump which propelled her into the lead. 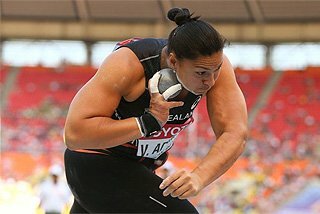 It was game over after she managed a 53.13m javelin throw. Ennis-Hill bravely defended her chances in the 800m but had to settle for silver with 6775. Thiam will also compete in the individual high jump. Greg Rutherford, the third British gold medallist from Super Saturday four years ago in London, also fell short on his Olympic title defence tonight. In a competition which saw the lead change several times, US champion Jeff Henderson claimed the 999th Olympic gold medal for his country in any sport. 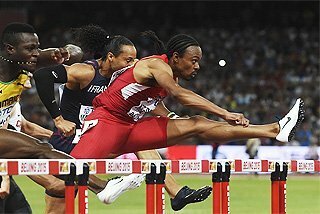 Henderson was sitting in fourth before unleashing his 8.38m winning effort which temporarily nudged Rutherford off the podium. Luvo Manyonga fouled his final round but his 8.37m would prove enough for silver with Rutherford finding his composure to move back on to the podium with his final-round leap of 8.29m. 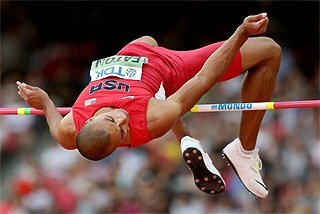 Henderson is the first US Olympic long jump champion since Dwight Phillips in 2004. After winning gold in Beijing and London, Shelly-Ann Fraser-Pryce was aiming to become the first woman to win three consecutive Olympic titles. 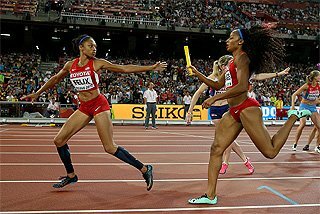 Although Fraser-Pryce hasn’t been in her 2012 or 2008 shape recently, her semi-final win in a season’s best of 10.88 was promising. In tonight’s final, Fraser-Pryce produced her traditionally explosive blast from the blocks and held on to the lead until the late surge of teammate and Jamaican champion Elaine Thompson. The fastest woman in the world this year, Thompson lived up to expectations and claimed the Olympic title in 10.71. USA’s Tori Bowie went one better than the medal she took at last year’s World Championships, claiming silver in 10.83 as Fraser-Pryce managed to hold on to bronze, holding off the late charge of Marie Josés Ta Lou by a mere 0.007. 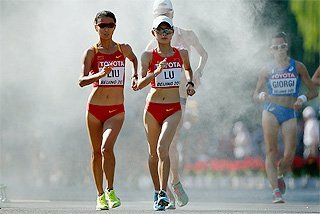 It was also the first 100m race in history in which seven women dipped below 11 seconds. Harting won the Olympic discus title in London in 2012. Harting won the Olympic discus title in Rio in 2016. Just not the same Harting. Robert, the older brother at 32 years of age, the more experienced and more decorated of the siblings was the major casualty from yesterday’s qualification rounds. It was the end of Harting’s Olympic title defence but opened the doors to a unique achievement in Olympic history. Christoph, 26 years old and a finalist at last year’s World Championships in Beijing, may have had a hard mantle to carry in today’s final; it certainly looked as though he was having the time of his life and why wouldn’t he? It was a fantastic competition in which world champion Piotr Malachowski was safely in the gold medal position with 67.55m. That was until the German pair of Harting and Daniel Jasinski decided it was time to shake things up. Jasinski improved to 67.05m in the last round; not sufficient to dethrone Malachowski but good enough to push Harting off the podium. Then Harting, the runner-up at the German Championships, unleashed a world-leading PB of 68.37m to keep the Olympic title in the family. Needless to say, it’s the first time in Olympic history that siblings have won back-to-back gold medals in the same athletics event. 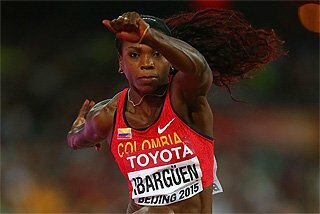 Two-time world champion Caterine Ibarguen has a purpose and a plan. Since taking silver at the 2012 Olympics, the Colombian has won 35 of her 36 competitions. Her purpose here is to win gold; her plan is to get there as quick as possible. In the morning qualification rounds, she jumped once. 14.52m was her mark. She waved, she smiled and went back to get ready for tomorrow’s final. Defending champion Olga Rypakova – who ended Ibarguen’s winning streak two months ago – and world indoor bronze medallist Paraskevi Papahristou were the only other athletes to hit the automatic qualifier. With 52 athletes lining up to contest for 15 places in the final, the women’s 3000m steeplechase was arguably the toughest qualifying round of the day. In the end, though, there will be 18 athletes in the final after the drama in the third and final heat. 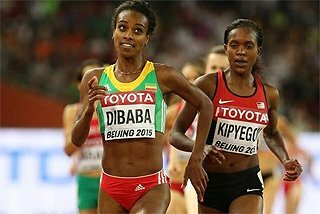 Ethiopia’s Etenesh Diro found herself involved in a tangle which saw her, Ireland’s Sarah Treacy and Jamaica's Aisha Praught go down. Diro’s right shoe partly came off in the incident and after several attempts to put her shoe back on, she eventually decided to take it off. A few strides later, she also cast aside her sock. 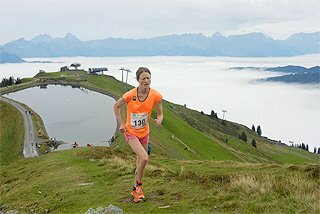 Diro crossed the line in seventh having lost a lot of ground on the leaders but she did get the loudest cheer – up to that point – from the crowd. Following a protest, Diro, Treacy and Praught were advanced to the final by the jury of appeal. The fastest qualifiers included Ruth Jebet, Beatrice Chepkoech and Emma Coburn while Lalita Babar, Genevieve Lalonde and Fabienne Schlumpf set national records for India, Canada and Switzerland respectively. This year hasn’t produced the same series of sub-44-second performances that graced the Bird’s Nest Stadium at last year’s World Championships, but it’s just a matter of time before that barrier is broken in Rio. Michael Johnson’s Olympic record of 43.44 could even be challenged. Today’s 400m semi-finals provided a pre-show to what is expected to be a thrilling three-way final featuring defending Olympic champion Kirani James, world champion Wayde van Niekerk and 2008 Olympic champion LaShawn Merritt. David Rudisha, the defending Olympic champion, has struggled with injuries since his memorable world record performance in London four years ago but fittingly he seems to be back to top shape. Rudisha ran a commanding semi-final to easily advance in 1:43.88. 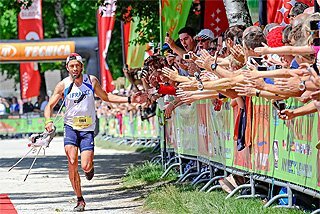 Pierre Ambroise Bosse of France and Alfred Kipketer were the other heat winners in a round which saw the demise of Adam Kszczot, Ayanleh Souleiman and Amel Tuka. On a fantastic morning of action at the Olympic stadium, the crowd stood to their feet to support Etenesh Diro after she finished her steeplechase heat with one shoe, and cheered loudly for Keila Costa in the triple jump and Geisa Coutinho in the 400m. But the Brazilian public saved their loudest cheers for Usain Bolt, the man who started his treble Olympic defence here in Rio. 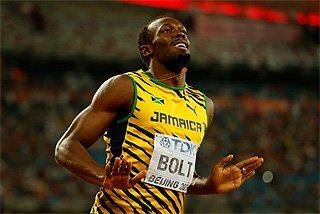 Bolt eased through his 100m heat in a super easy 10.07. Times matter little in the first round, but tomorrow is the time for serious business as he contests the semi-finals and, surely, the final. All three Jamaican and US sprinters advanced to the semi-finals. China, France, Great Britain and Bahrain will have two each.